Most people are using these 3 terms interchangeably, “heart attack”, “cardiac arrest” and “stroke. Well that’s a mistake, since though they are all connected to heart, they have different reasons for appearing, as well as different symptoms and effects on the body. Being able to distinguish these terms can be of vital importance in seeking the proper treatment, as well as helping someone with one of these conditions. Read our post to understand what each of these conditions mean, what their symptoms are and how to properly react upon facing with them. When the flow of the blood rich with oxygen is blocked to a certain part of the heart muscle, if not restored causes dying of the muscle, thus resulting with heart attack. If a person has a heart attack, his/her heart continues beating. If your heart’s electrical activity undergoes chaos, it’ll result with irregular heart beating, and immediate stop of the blood pumping throughout the body. This condition is cardiac arrest. In this heart condition, the heartbeat stops completely. Transient ischemic attack (TIA):it’s called a “mini-stroke” and appears when the artery which transports blood to the brain, temporarily stops transporting the blood. 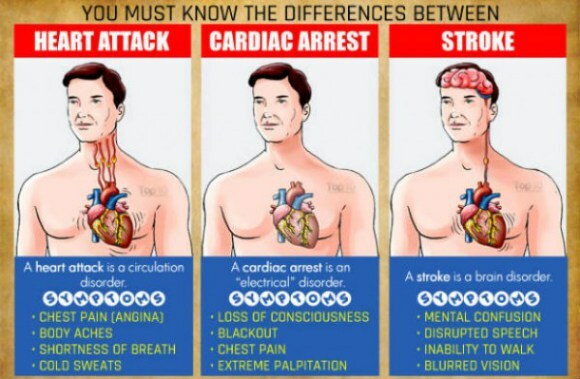 These are the heart attack symptoms which can occur early on and last several days. Pain in chest (angina): Often characterized as heaviness in the middle of the chest, and confused with indigestion. It can come and go in a matter of minutes. Aches in the body: pain in the neck, abdomen, back, jaw, and arms, especially the left one. You can’t treat these symptoms with home remedies or medications, since they are connected to the heart, and not to the digestive or some other system. These symptoms are appearing suddenly and are often resulting in instant death. Person who has suffered a heart attack has a greater risk of experiencing a cardiac arrest.